An opinion poll has revealed that 73% of Egyptians believe President Morsi did not make a single good decision during his first year in office, while 63% believe their standard of living has worsened. The telephone poll, conducted by Baseera for Al-Hayat TV network, asked 2069 Egyptians aged between 20 and 23 for their views on the president. According to the poll 15% believe Morsi did not take a single bad decision, while 6% believe all his decisions were wrong. Seventeen percent believe his worst decision was over the Nile dam crisis, while 8% believe it was the November 2012 constitutional declaration. Six percent believe Morsi’s decision to force ex-minister of defense Tantawy and ex-Chief of Staff Sami Anan into retirement was his best decision. Cutting relations with Syria and the recent appointment of new governors were Morsi's worst decisions according to 5% of respondents. Thirteen percent believe their standard of living has improved over the last year, 22% say it is unchanged, while 63% believe it has worsened. Eight percent believe Morsi's performance was better than expected, 64% believe it was worse and 15% believe it was as expected. More than 70% believe the economic and security situations have worsened, according to the poll. 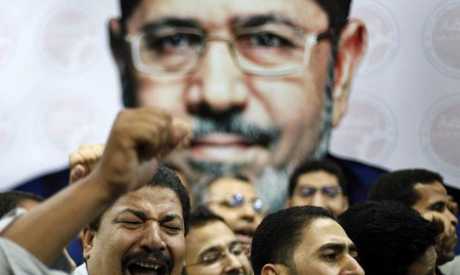 “Among those who support the Muslim Brotherhood, 98% say their lives have improved. Among the rest of the population over 80% say their lives have worsened, that’s a deep division,” the pollster said. “Ninety-two percent of Muslim Brotherhood supporters reject the contention that the Brotherhood intends to control the state and Islamise it. On the other hand, 93% of the rest of the country said that is precisely what the Brotherhood is doing,” it added. The Arab-American Institute surveyed 5,029 Egyptian adults from across the country. Never though Cairo is THIS BIGGG !!!! Three times the number of people who elected Egyptian President are now out in streets.. - Naguib sawiris. So according to Naguib sawiris's logic a square with few kilometer inside a city with dense structures could accommodate 30 million-- May be he feels Egyptians are people with peanut brains..
Do you think it is possible that Mr. Sawiris did not mean that everyone who is protesting against President Morsy is in Tahrir Square. According to news agencies, there are protests all over Egypt. West have institutions that are fair and transparent conducting polls. Their polls and content of questioning are agreed with parties. Here you come Egyptians wanting to conduct polls to fool us around. When did you qualify to do it before Mubarak or After Morsi ? Your polls have as much credibility as assertion of 22 million has. These are organisations accused by SCAF of being funded from abroad.. To cause disagreement amongst Egyptians.